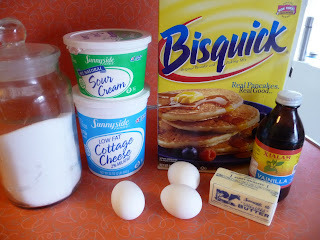 Nana Recipe Wednesday—Baked Cheese Blintzes! I don’t know what was so funny here, but clearly Nana and Boppa are having a good old time. I actually cropped this photo, because I’m in the original—looking like someone told a joke that I didn’t get whatsoever. I was kind of looking at them with my mouth half open and that just wouldn’t do. I also realized after I picked this photo that Morrocan restaurants and cheese blintzes have absolutely nothing in common, but let’s just go with it, shall we? I remember Nana making regular blintzes every year for a while…on Easter I think….but then I think she said that they were more work than they were worth. Well, I disagree with that of course, but of course I haven’t ever made regular blintzes either. I did find this recipe for baked cheese blintzes, which was very intriguing. 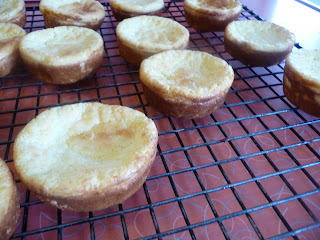 You mix everything up, pop it in muffin tins and it tastes like a blintz. That’s awesome genius! Yes, Bisquick. The miracle ingredient. 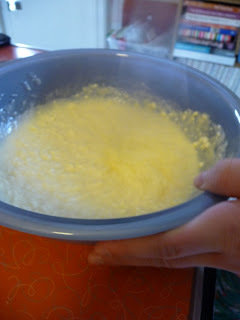 Beat the eggs in a big bowl. Then add in all the other stuff. 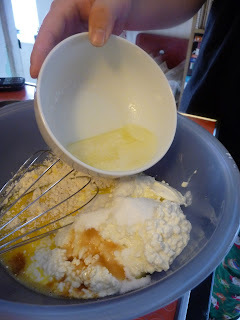 Use a mixer, or your tireless teenaged son to mix this about so that it is completely mixed. 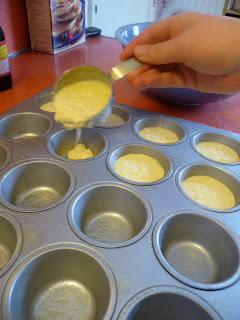 Grease the muffin tins (I used the spray stuff) then fill them 2/3 full. Bake them for 30-40 minutes, so that they are lightly golden. Let them cool slightly on a rack. 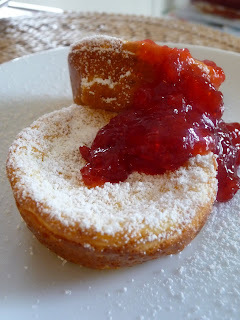 Sprinkle with powdered sugar and serve with homemade jam. Of course, you could use store jam, but homemade is the very best. 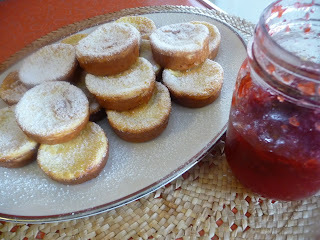 This summer I’ll show you how to make freezer jam so you have some on hand for times like these. Looks yummy, doesn’t it? Well, they were. The flavor was very close to a traditional blintz! Cheesy and eggy, with the sweet strawberry jam….mmmmmmmmmm. And they only took about 10 minutes to make, if that. Possibly the easiest Sunday brunch ever! Preheat oven to 350*. Grease muffin tins. 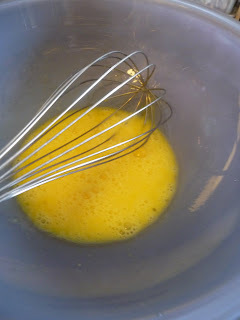 Mix above ingredients together with mixer or by hand. Fill muffin tins 2/3 full. Bake for 30-40 minutes, or until set and golden brown. Let cool slightly on wire racks, but serve hot, sprinkled with powdered sugar. Serve with sour cream and jam.